I'd like to share with you my eldest girl's 'narration' of Beowulf. She asked me to share it as well. It's a little unusual for a narration, and perhaps that isn't the right term for it. She chose to write a study guide. I'm sharing it for a couple reasons - one, I thought it might help some of you in year 4 make sense of Beowulf. Second, I thought it might be useful to see how creative you can get with narrations as your children get older and more proficient. Thirdly, I thought you might enjoy seeing the work of an older homeschooled child. She has been hsed for all but Kindergarten (sending her there was a terrible error in judgement on my part). We have dabbled with workbooks and unit studies, but always focused primarily on literature based education. She wrote this when she was 17. She just had her 18th birthday a couple months ago, and has made some minor revisions since then. Lastly, my daughter would like to see if people can actually use her study guide, and she desires any feedback or constructive criticism you have to offer. 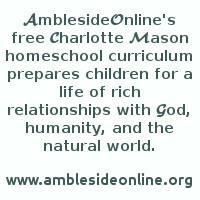 This is not an official AmblesideOnline study guide - but if there is something there you can use, my daughter and I hope that it is a blessing to you- and that you can give her the feedback she craves. She had a lot of fun writing this study guide, and she hopes to do more (English Lit is her favorite subject). Nicole has set up a separate yahoo account just for feedback on her study guide. Oh, and the guide as written is supposed to take about 6 weeks to do. I would suggest that if you use it, you simply stretch it out and give yourself 12 weeks - or one term. "The Beowulf Poet" - a collection of essays. Compiled by Donald K. Fry. Prentice Hall Publishers. This title is out of print. I was able to get it from our library, so I'd encourage looking it up there, at www.bookfinder.com or putting it on Interlibrary Loan. "The Art of the Vikings" by Shirley Glubok This title is also out of print. We checked out a copy from the library. Caution - This book does get gory! Beowulf fights with monsters and dragons, so please be prepared for blood, bones, etc. "Nearly all the censure, and most of the praise, that has been bestowed on Beowulf has been due either to the belief that it was something that it was not- for example, primitive, pagan, Teutonic, an allegory (political or mythical), or most often, an epic..." J.R.R. Tolkien "Beowulf: The Monster and the Critics"
I have held discussions with friends about this book - and many of them say that they didn't really care for Beowulf. When asked why, their response is "I know it's supposed to be an allegory, but I just couldn't figure it out." Please understand that this poem is not an allegory! I read Dorothy Sayers & Margery Allingham on cold winter evenings to help pass the time or to simply cheer me up and divert my mind from the fact that the weather is acting brutal, as usual. I think that this is mainly what Beowulf was made for, to help pass the time in medieval halls. This was a story that would hold the interest of its listeners- a bold story of a hunter-warrior conquering fiends such as Grendel or the dragon. This wasn't an allegory simply because at this time dragons and half men were very real. Looking back through the centuries with our 21st century knowledge, we know better, so we attempt to pick out a few allegorical bits - but for the men listening to the story, it was just that - a story. Beowulf is the Christian hero in an adventure story written to help pass time. Because death was such a looming threat in those days there are many "deep" passages about God, death, life and religion. But while there is good meat for reflection, it is not an allegory. This saga was written from a distinctly Christian viewpoint. While I read I decided to write down the different names for God I came across - and there are several. A few of them are, "Measurer, " "Wonder King of All" and "World Shaper." The writing and language of this tale are immensely powerful. Images come rising up out of the pages. This book is a classic not because it is old and ancient, but because its writing is some of the most evocative ever. How to use this study - I have a couple suggestions for using this, but this study is a tool- please work it around to the way you'd like it. I've made day suggestions, but these are not written in stone. The student should read the day's assignments over, do the reading, and then do the activities. I would suggest getting a 3 ring binder to keep records/notes in (some assignments include drawing a picture, finding a place on a map, etc.). I only specifically assign a written narration once in this project, at the very end for a written narration of all of Beowulf. However, as the parent- feel free to assign either written or oral narration depending on the student's needs. If you'd like to dialogue with your student on this book it might work to read over the assignments with them, have them do the reading and then do the assignments together or do a written dialogue, with them answering questions on paper. Days 1-3 - Read three chapters a day from Sutcliff's "Dragon Slayer," narrating after each reading, either orally or on paper. This book gives a very good overview of the story. Consider Introduction-60 as a bit of a "prologue," if you will. * Passages 60-90, what is described? How does this sound? Find pictures of early Norwegian/Danish Churches and halls. Notice how they closely match the description in the book. Contrast today's reading with what you read yesterday. People are scattered and frightened by this murderous creature. How does the author describe their fear? Passages 170-180 are very interesting. The author criticizes idol worshippers. He sees this as something very empty. Praying to names that will never help them..."
In the home of the Geats, the story of Grendel was told. We are made to feel the strength of the heroes. Beowulf sails, tells Hrothgar his mission. Notice the meaning of Unferth's name... One might wonder if other names in the text were analogous to certain meanings. Beowulf is challenged by Unferth. What sort of person do you think Unferth is? Stanzas 600-640 describe a time of great feasting, but overshadowed by the knowledge that Grendel will eventually come for the kill. Notice the beautiful imagery... what does this phrase mean? (570) "God's bright beacon burnished the Sea"
-- last part of 660-680, "matched against evil the Measurer's strength." Remember, although this poem is not an allegory it does have an overtly Christian view. Be on the lookout for signs of this. Bits of the passage bear resemblance to the story of David & Goliath. Weapons mean nothing to God. 700 - "tis truly known that God manages men of this earth"
700-740 - What does this passage state about Grendel? About joy? We now listen to a song praising Beowulf and comparing him to Sigurd (or Siegfried). This account later made its way into one of Wagner's most famous operas, Nieblunglied. If you want more on Siegfried read Clyde Robert Bulla's "The Sword in the Tree"
900-950- Beowulf and the Lord are praised. What are some of the gifts that Beowulf receives? Check out the album "Anuna" from the library and listen to some of the harp songs. read "Viking Art" by Shirley Glubok to get a good look at what jewelry and artifacts from around this time would have looked like. Wealtheow makes a plea to Beowulf. What is her plea? Notice in 1260 the reference to Cain & Abel. Why are they referred to? What does this phrase (from 1300) mean? "It was woeful bargaining each party to pay the price of slaughter with a loved one's life." This passage covers Hrothgar's heartbreak at the loss of his companion, his anger at Grendel's mother and his challenge to Beowulf- go get her! Notice in 1380-1420 how the writer wants you to visualize what the Danes saw. He describes the whole scene so we can feel as if we've been there. * 1460-1470- What is discussed concerning Unferth? What does this phrase mean? "he dared not dive in that deep hell water to foster his fame he forfeited there stories of his past." Beowulf reminds Hrothgar of a promise. What is the promise? Describe the battle with Grendel's mother. What does Beowulf do immediately after winning? As God's bright candle glows in the heavens." What do the shield Danes do? What to Beowulf's followers do? Hrothgar makes a speech- what is the message he is getting across and whom does he use as an example? Notice the significance of the first part of today's reading. What do they do? Why is that so important? Narrate the speeches that Beowulf and Horthgar make to each other before Beowulf returns home. Notice the vivid word imagery used, phrases like "The sail crackled..." What other picturesque phrases can you find? There are several! The poet weaves a story in here. Read the notes on pp 61, 62 to get a good background. Spend a few minutes looking up any information on the two Kings of Offa. Choose a part of today's reading to narrate. What does this phrase mean? "When heaven's gem glided under the earth." Beowulf tells of his adventures, does he embellish at all or add to his story? What is the history of the jewels? If you can find a copy, read "The Story of St. George and the Dragon" (by Margaret Hodges) to a younger sibling. Draw a picture of the stolen goblet. Notice Beowulf's attitude after his castle is burned. Does he wallow in self pity? What does he do? What does this phrase mean? "The border of loan days had come for that lord last of earth moments." Find a phrase/ paragraph that you like and copy it. Beowulf begins fighting alone, and is losing. Who comes to his aid? Why? How is the dragon conquered? What is his attitude in the middle part of 2790? Copy this phrase- "...judgement of God would always guide the destiny of every man creature as it always does..."
What is better than a wasted life? Do you agree with Wiglaf? Why or why not? How does the decree concerning the jewels differ from Beowulf's wishes? Notice the powerful references to Heaven, God and the dead king. Read Tolkien's essay on Beowulf and choose at least one other essay in the collection to read. Write feedback on this study to Nicole! Copyright 2001, Nicole Capehart. You are welcome to print this study guide, use it and share it, at no cost, with your friends - but please keep this copyright message attached. Do not alter the study guide if you share it.